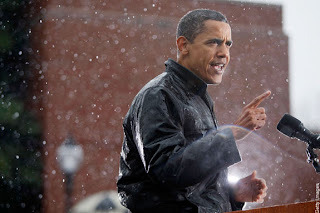 I'm sorry - but there is something about a man who will follow through - rain, sleet, or snow. 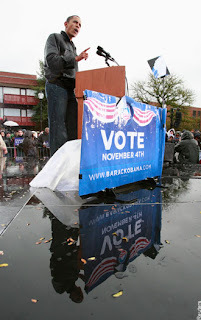 Michelle was even out in the rain! I LOVE IT! 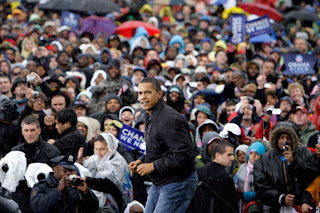 Wearing jeans, white sneakers and an insulated windbreaker, Barack Obama delivered his stump speech this morning in a chilly, steady rain in Chester, Pa.
"A little bit of rain never hurt anybody," Obama said, surveying the soaking, umbrella-covered crowd at Widener University, occasionally rubbing his hands together for warmth and squinting through the raindrops. Obama took the stage less than an hour after the McCain campaign announced it was postponing a rally at 1:15 p.m. in Quakertown, Pa., about one hour north of Chester, "due to weather." Lol, McCain is too old to be out in the rain he would catch his death. Love it! That's the kind of man I want running the country. One that's not afraid to get out in the elements and do the damn thing! First it's a crisis in DC that needed McCain's immediate attention (forcing him to try to cancel the debate) and now it's raining too hard? 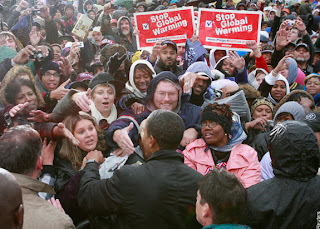 And they call Obama pampered and elitist? You know what, that's his mama's side of the family in him. 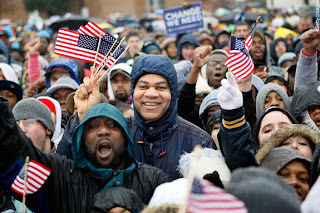 This man announced his candidacy in the freezing Illinois cold outside of the capitol building AND he's having his election night party in Grant Park in Chicago in November(I think I'm going). Let me repeat that though... it's November. in Chicago. It might as well be January in the north pole out here. 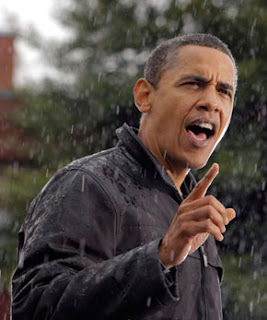 Yeah, the weather does not affect our future president at all.